Summer Fest is in full swing and this week we’re celebrating corn, one of summer’s sweetest pleasures. I have many fond memories of eating fresh corn on the cob in summer – sweet and salty and dripping with butter, it was always a welcome treat. There’s even a special place in my heart for those funky plastic corn holders (shaped like corn cobs, of course) that my grandma would stick into the ends of the cob to keep our fingers clean and unburnt. I can still remember how they felt in my hands as I rolled the hot corn against a cold stick of butter until it was was coated with a thick, drippy layer and the stick of butter had molded itself into a shape more suitable for the task at hand. And then there was the eating. My sister and I would race through the rows of kernels, typewriter sound effects in full effect, enjoying the messy act of eating as much if not more than the delightful flavor of the corn. Corn on the cob is still a delight, but it seems that I was much less annoyed by corn stuck in my teeth when I was a child. It drives me crazy now! Well you don’t have to worry about corn sticking in your teeth when you cut it off the cob to make this delicious homemade creamed corn. It might not be quite as fun to eat, but the flavor will more than make up for it. 1. Husk corn and cut kernels off the cobs (you should have about 4 cups kernels); set aside. 2. In a medium saucepan, cook bacon until crisp. Remove bacon pieces with a slotted spoon and set aside; pour off all but 2 teaspoons of the drippings. 3. Add shallots to the pan with bacon drippings and cook over medium-low heat until softened, about 3 - 4 minutes. 4. Pour water into the pan, turn heat up, and scrape up the brown bits. Add corn, bring to a simmer, then cover and reduce heat. Cook for 10 - 15 minutes until tender. 5. Add cream and rosemary and simmer for a few minutes longer until slightly thickened. Stir in bacon pieces and season to taste with salt and pepper. 6. For a thicker consistency, puree a small portion of corn and liquid in a blender then return to pan. first delivery of olathe corn is just days away ... will try this one as soon as i get my hands on some. It's funny. I am not a huge corn fan. Never have been. But you make that creamed corn look so yummy. The bacon sealed the deal!Here is something I am thinking of trying out. http://www.foodnetwork.ca/recipes/Herbs/recipe.html?dishid=8006My corn in my garden did not do so well. Bummer. There is always next year! I made a corn and green zebra tomato salad in honor of Summer Fest... http://blog.healthy-green-lifestyle.com/corn-and-green-zebra-tomato-salad.html I love corn and can't wait to check out all the other recipes this week! Hi Nicole, this looks delicious. I bet the savory rosemary is wonderful with some nice sweet corn. I'm also participating in summer fest this week, and posted Thomas Keller's recipe for creamed corn here - http://mysocalledknife.com/2010/08/thomas-kellers-creamed-corn-and-summer-fest-2010/. This is my first Summerfest and I am excited to browse through so many corn recipes! I’m also sharing a corn and tomato salad today.http://www.thefoodpsychologist.net/thefoodpsych/?p=384Enjoy! Sweet corn is still best when you've got the water on the stove boiling when you go out to pull the ears. I agree with you about the "corn in the teeth" thing. It never bothered me when I was a kid, but now it drives me crazy! (doesn't stop me from eating it though.) This creamed corn looks amazing. Since I do not have a patch of corn in my backyard, I'll have to settle for using some I got yesterday that I stashed in my refrigerator. Great Summerfest theme! Thanks for the links- I have lots of corn to use up! I love corn in all its forms, including, canned creamed corn... But nothing beats summer corn. Here's my Summer Fest entry: Corn ChowderMy recipe for Fresh Corn Pancakes should be up shortly. I've had creamed corn before, but never with rosemary and never one that looked this good! I made this delicious satueed corn with tons of herbs from the August Bon Appetit - it was super good, and no silk in my teeth! Thanks for checking in at The Wright Recipes. Creamed corn? The best, though I must be honest that anything with bacon, rosemary and a hearty douse of heavy cream is pretty much heaven to me.For me, this corn celebration has brought out a good Pickled Corn with Summer Onion and Basil recipe: http://www.thewrightrecipes.com/savory/summer-fest-2010-corn#more-4099Let's keep in touch with the new, delicious things that we bring to our tables! Could your creamed corn look any more delicious. (No. No is the answer!) This week I made Grilled Corn Salad with Lime Vinaigrette on Corn Cakes. I've got to admit that it's the first thing I’ve made this year with corn b/c I’ve been too busy eating it straight off the cob.Can’t wait to look around and see what others made this week. Ooohh.... now that is some creamed corn - going to have to try this recipe for Thanksgiving!!! Summerfest 2010 is too much fun - great recipes and great stories!! Here's my contibution to the party! Corn, Crab and Tomato SaladEnjoy! I can not believe I've never thought of adding bacon to my creamed corn. You're a genius. That looks great! 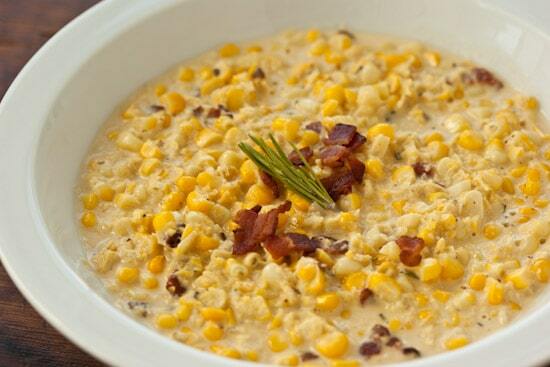 We're right in the middle of sweet corn season as need to start looking at ways to use it up. This chowder looks like a winner. I love cream corn, the bacon in it sound fantastic!! thanks so much for a great post! Corn with bacon?? Yes PLEASE!I've made some Fresh Corn and Black Bean Salsa to celebrate Summer Fest. The corn here has been insanely good! We had those little plastic corn cob holders too! I wonder if my mother still has them. Nice memories. Thanks for the great post. Summer corn is the best. You and your sister are like My sister and I! I was always jealous that she could eat her corn in neat rows, getting the best parts out, while my cobs looked shaggy and disheveled! My husband is after me to try some southern creamed corn (he mentioned it today!) and now I have a source I trust. And this is my contribution to the Summer Fest. http://bibberche.com/2010/08/grilled-corn-with-chipotle-lime-butter/ Thank you! So happy to have found your site thrugh Twitter. Amazing photography and great recipes. Looking forward to following! I made this last night, it was very good! Thanks for the great idea!! OMG I am drooling. Wow. I’d be inclined to bury the hatchet with you on this. Which is not something I usually do! I enjoy reading a post that will make people think. Also, thanks for allowing me to comment! Wow! It's as if you comprehend my mind! You appear to know so much relating to this, as if you wrote the book in it or something. I feel that you simply might perform with a few images to drive this content home a little, on top of that, this is educational weblog publish. The fantastic read. I will certainly return. In the eyes of spectators, people who wearing cheap shoes have taste, and exudes charm.